MINIMAN at Big Husky has become renowned for it’s fun, inclusive and supportive atmosphere. ALL of our young champions receive a commemorative Medal when they cross the line with a great sense of achievement. The Swim Courses will be in shallow water of White Sands Beach, Huskisson. The swim will be a beach start commencing at the southern end of the beach. The swim may be in wave starts depending on the number of competitors. Athletes will be grouped in their appropriate wave (age) categories on the beach area. Competitors will swim in a straight line to the finish bouy and make their way up to the transition area in White Sands Park. Competitors may wade in shallow water if required. All athletes will obey the NSW RTA Road Rules and race approved traffic control personnel.The cycle course will be a single lap circuit. Athletes will commence the Bike Course at White Sands Park. After exiting the water, athletes will run up the steps and continue to the Transition Area where they will change into their appropriate cycling attire. They will push their own bicycle to the road way and commence the cycle leg at the appropriate official start line marked on Duncan St.
Cyclists will mount their bicycle and head towards the shops. They will turn LEFT into Owen St and continue to the Sydney St intersection and turn RIGHT onto Sydney St.
Cyclists will proceed along Sydney St and then turn around at Dent St, and return along the same route until the Hawke St / Duncan St intersection is reached. At that intersection the cyclists will turn LEFT into Duncan St and then to the transition area at the White Sands Park, where they dismount their bikes and commence the run leg. The run will commence at White Sands Park. Runners will follow of all cones, paths and walkways unless otherwise directed. Runners commence the run by running out of the transition and then proceed along cycleway and then turn around for the return leg to the finish arch. The Swim Courses will be in clear water of White Sands Beach, Huskisson. The swim will be a beach start commencing at the southern end of the beach. The swim may be in wave starts depending on the number of competitors. Athletes will be grouped in their appropriate wave (age) categories on the beach area. Competitors will swim around the markers to the finish bouy and make their way up to the transition area in White Sands Park. All athletes will obey the NSW RTA Road Rules and race approved traffic control personnel. The cycle course will be a one lap, out and back course. Athletes will commence the Bike Course at White Sands Park, Huskisson. After exiting the water, athletes will run up the southern stairs proceeding straight ahead to the Transition Area where they will change into their appropriate cycling attire.They will push their own bicycle to the road way and commence the cycle leg at the appropriate official start line marked on Bowen St.Cyclists will mount their bicycle on Bowen St and immediately turn RIGHT into Hawke St. They will turn LEFT (at the roundabout) into Owen St and continue to the Sydney St intersection, turning RIGHT onto Sydney St. Cyclists will continue onto Tomerong St to the Woollamia Rd intersection. Cyclists will turn RIGHT into Woollamia Rd. and ride to a turnaround point situated just before the Duranbah Cl intersection. 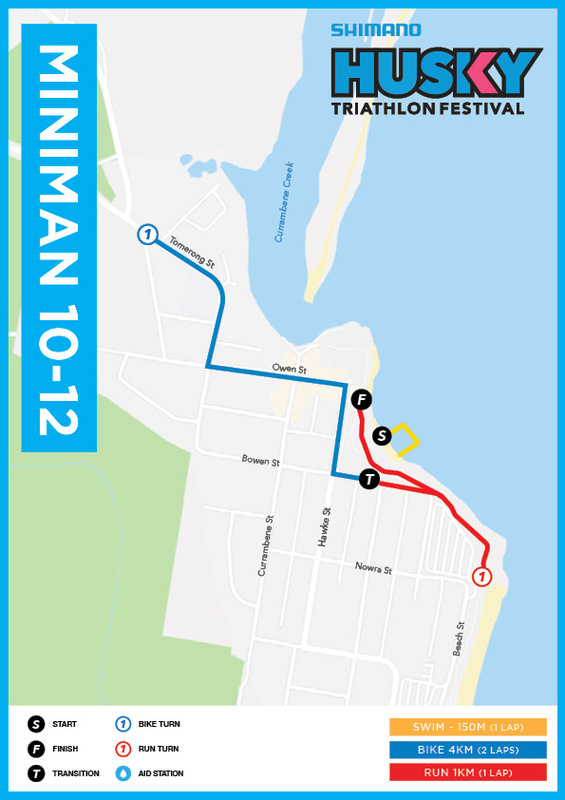 At this point cyclists will complete a U TURN and return to White Sands Park the same way as they proceeded out.When reaching White Sands Park, athletes will turn LEFT into Bowen St and LEFT into transition area to complete the bike leg.